We were at the beginning and we were very young. We didn't know what to expect. Before we started recording our debut album, we had recorded 2 demos. For recording of whole album we received offer from label called No Remorse Records. This label was at the beginning as well as us. They didn't have the experience with promotion of new record. By a chance we have met man called Kalle Trapp, who was in charge of Kalle Studios and he was also skilled producer at that times. We didn't have an idea what recording of an album takes. At the beginning we were taking it as a fun, we were trying to have as much fun as it was possible. We all had our jobs, so during the day we were at work and at night at studio. It was very hard period. The place where I was working was about 150 km from the studio, where it wasn't easy to get. Train connection was really bad. I used to get up at 5 a.m. and I've gone to bed at 4. Sometimes we didn't sleep at all. I've slept for a while in train, then I was at work to 4 p.m. and right after finishing there I ran to the studio. There wasn't other way, we had to earn for living in some way. Back in the day, only few people had known about us. We had a status of an underground band. Before signing with the label, we were in very different situation. For writing new stuff we have had as much time as we needed and wanted. We were putting the songs together for about 2 years. The very first song we wrote was Wizard's Crown. But suddenly we had contract in our hands and because of that everything had to be fastened. There wasn't much time for writing new songs. We still needed 2/3 more songs and we had to do them as fast as possible. 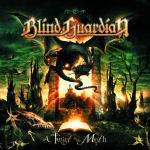 The last songs written for this album are Guardian Of The Blind and The Martyr. We're working on them under pressure. Kalle had a radical influence on the album. We were young and inexperienced and it was him, who helped us since beginning and who introduced to us all work in studio. He advised us, which songs are good for album and how their final version is supposed to sound. From the musical point of view, Thomen showed up to be the most skilled out of us. He dealt with his parts very well and he learnt all songs very fast. Remaining musicians had few problems at beginning. Especially for me it was very hard. I was playing the bass and singing. We weren't used to each other in case of playing so that's why the recording took so much time. Thomen dealt with all songs without bigger problems so maybe that's what made us to work hard. It's noticeable that we were partying quite a lot because it is visible on the result. In my opinion songs are very good, but while listening to them now I realize how little experience we had and from the album it is quite obvious that we were beginners at that times. I was more concentrated on bass than on singing, so when comparing it with singing on other albums it is clear that it was necessary to improve and work on vocals. When I rate this record, the best song in my opinion is Run For The Night, because it is the only song on this album which has some kind of commercial aspect. On the other hand, the most popular song was Majesty. When we released "Battalions Of Fear" we thought that we'd become superstars quickly. We were sure that the record is awesome and that it has everything what is expected from heavy metal album. We didn't become superstars and we were disappointed that in reviews we were receiving 7/8 points and not 10 and more. He had made good, but it wasn't a sensation in which we were hoping. Label didn't have the money for good promotion of us. There were lots of bands better than us, so we had to make up that we are still and underground band and carry on. We didn't peak the big heavy metal community. We supported our album by having about 10 shows in Germany. We played with band called Grinder and there was usually an audience of about 70/80 people at each show, but in worst case there were 12 people. People liked us, and after this series of concerts we started to be in their good books. And about the name… At our early years we called ourselves as Lucifer's Heritage. People from label told us that this name is not good for melodic speed metal band. We liked this name but we weren't clung on it, at all. We made it up when recording our first demo tape. We started to think about a new name and we came up with many possibilities. For a while we were called Battery, after the title song from Metallica's Master Of Puppets. We liked this thing a lot and a Battery seemed to us as a strong and perfect name for power metal band. But then we found out that this name is already taken. 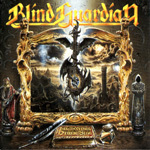 We have a song called Guardian Of The Blind and we also really liked using the word "guardian" and then we finally chose the name: BLIND GUARDIAN. Before we started working on new album, we quite changed our musical ideology. Before bands like Iron Maiden and Helloween influenced us. Then we started to be interested in progressive bands like Fates Farning and we also listened a lot thrash metal bands like Testament. Of course NWOBHM influenced us a lot, e.g. bands like Satan, Demon. These influences became stronger and stronger, that's why is "Follow The Blind" our heaviest album ever recorded. We didn't have much time for it. Concerts in "Battalions Of Fear Tour" ended in late 1988 and it was thought that we'd go to studio in early 1989. We went to rehearsing room and all songs were put together during 4-5 months. We were only rehearsing there; other things were done in studio. We weren't doing any pre-production. Kalle was trying to capture the atmosphere and the raw feeling of the songs. In studio lots of other bands used to visit us, so we were partying more than when we were recording our first album. I think that you feel the roughness from the album, which is reflected not only in songs, but it also, reflects our lifestyle in that time. In comparison with "Battalions Of Fear" there was also big change in case of lyrical concept. 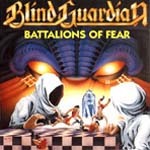 Lyrics on "Battalions Of Fear" were inspired by fantasy stories, however lyrics on "Follow The Blind" are more serious in some way. I can imagine writing lyrics like those also now. Valhalla had become the most popular song from this album. Everyone, who had heard it in studio, was enamored with it, and they told us that it would be one of our biggest hits. Kalle told, that he is a good friend of Kai Hansen and that he can speak with him about making a guest appearance on our album. We sent him the record and Valhalla engaged his attention and he even started to Blind Guardian as a band. Kai was very open and he agreed with the cooperation. For us, it was really great experience to be with him in studio and also having him as a guest on "Follow The Blind". After the experience with our first tour, we decided not to do any. Instead of tour we decided to do weekend concerts. We had about 30 gigs in Germany, but on weekends only. We started on Friday and we returned home on Monday. Media regarded "Follow The Blind" as weaker record than "Battalions Of Fear", but reactions from fans were different and also very awesome. Even though we were playing in small venues, they were full. Status of an underground band disappeared and after release of "Follow The Blind" we were on the same level as Kreator, Grave Digger, Running Wild and Rage were. This record brought us to top of German heavy metal scene. Even fans in other European countries started to register us. We still weren't earning a lot of money, but the album was selling better than we expected. Because our first album had bitten the dust, lots of people were telling us that we should give it up. Label had financial problem, and meantime they signed contracts with other bands, which weren't very successful e.g. Grinder with which we were on tour. But for us, the situation started to change. Weekend gigs were successful; album was selling good and the label started to support us more. We received about 15 000 Deutsche Marks. It wasn't so much money from which we could live, but thanks to it we could afford continuing on good standard. Instead of spending the money on whatever we decided to invest in 24/track machine and we started to work on new material. Finally we were in situation in which we could work on professional standard. In rehearsing room we recorded almost everything and we were working on each detail carefully. When arriving to the studio, we had a definite vision how the final version should look like and also the songs weren't only in their early version. 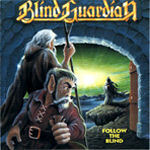 Between albums "Follow The Blind" and "Tales From The Twilight World" there is the biggest approval in case of quality. We started to use choirs, and we were concentrated a lot on choruses and guitars and we worked in style of Queen. Queen were very important band for Blind Guardian. Our music is more influenced by heavier bands, but in early 90's we listened a lot to Queen's earlier stuff e.g. A Night At The Opera (1975) or Jazz (1978). Queen had a huge influence on creation of songs on "Tales From The Twilight World". Whole album is mystical and fantasy. I'm not talking only about lyrical side, but also about musical side. In songs Celtic and folk motives appear, which are characteristic for our music also nowadays. Our studio had moved to Hamburg and suddenly we were in the centre of going on. We were still young, so we were enjoying the money, which label invested to us. No Remorse Records joined with Virgin Records and they were pushing us a lot to work. This was the first time when we attained an international success. We were successful in lot of countries, but our biggest success was in Japan. In Japan, we hit the charts for the first time. I think that we got into a Top 50 most selling interprets. Media started to be interested in us, we were making bunches of interviews. 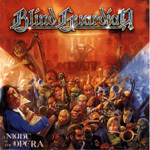 It was obvious that something big would happen around Blind Guardian. We signed a contract of franchise with JVC Records, which is representing us in South-East Asia till nowadays. Suddenly we were wanted almost everywhere. Medias were writing and talking about us and we had our unique style and sound. Of course you can hear influences from other bands in our music, but I really think that we have our own style and face, but we also had to deal with some other problems. Fisrt leg of European Tour had to be cancelled due to Thomen's health problems and he had to undergo a surgery. We decided not to hire other drummer and so we cancelled those concerts. It took 6 months until Thomen's recovery, but the fans still had the record in their minds. We were ready to go on tour, so we accost our promoter, who was willing to help us. Hammer Production brought us together with Iced Earth. It was in early 1991 and shows were very successful. In Germany we had about 800 people coming to see us. So, this is how our friendship with Iced Earth started and it lasts until nowadays. We really enjoyed it and we have had good times together. Unluckily we had to cancel few gigs because of Thomen's injury, so it wasn't pleasant for any of us. We weren't in easy situation. Expectations for our next album were high. Every label will tell you that the third album is the most important in discography of an every band. It will make or bury the band. After the success we gained with "Tales From The Twilight World", it was up to us to hold our position in metal scene and to not became considered as a band that came into success through night and, which then burn out very fast. But our success didn't come from one day to another. Even though we hadn't been having good times we didn't give up we carried on. And that redeemed. In early 90's grunge came into spotlight, but we couldn't complain about shortage of an interest from fans. However I'm sure that if we'd founded the band 5 years earlier we would have been even more successful. When we started writing new songs we're under pressure and that signed on all band members. We weren't able to concentrate so well, as we were able on previous album. A lot of things were neglected. It took much to put together first 3 songs; it really took a much time. That's why there was bigger between "Tales From The Twilight World" and "Somewhere Far Beyond", than between "Follow The Blind" and "Tales From The Twilight World". "Follow The Blind" is good album, but it's not such a breakthrough in our discography as "Tales From The Twilight World", when considering its success. It was a song called Time What Is Time, which was written first. When it was finished, we were sure that we were on good way to remain on the standard of "Tales From The Twilight World". Then we only continued working on new stuff. Next song written was Ashes To Ashes. When we wrote Tommyknockers on "Tales From The Twilight World", we used to say that this is the best musical way for us. We were very pleased with this song, but when we wrote Ashes to Ashes, it was sure that this song will be the one which best defines Blind Guardian style. In comparison with "Tales From The Twilight World", songs on this album are slower and also maybe more melodic, but not pop-like. Thanks to songs like Theatre Of Pain and The Bard's Song (In The Forest) we moved somewhere elsewhere. The moment in which we had first 3 songs written, we were in form again and ideas new songs came spontaneously. We were self-confident again. Which is for musician very important if he want to continue in writing new songs. We experimented and we combined folk with metal, which was no band doing at that time. It's obvious that in case of musical direction Skyclad inspired us. And we also knew that vinyl era is at its end and CD's will replace vinyls, so it was necessary to work precisely on sound in studio. We wanted to make this album special in some way and we thought about doing some cover. Because we were big fans of Queen, this band came into our minds first. I didn't want to cover song, which was Queen's biggest hit e.g. Bohemian Rhapsody or We Are the Champions. We didn't want people to think, that we want to become superstars at the expense of something, which was originally by someone else earlier. By cover Spread Your Wings we wanted to pay homage to Queen itself, and we also chose it, because we thought that it would be easy for people to sing it. I was really surprised how the cover ended up. We weren't as good musicians as Queen band members were, nut when considering our abilities at that time, it ended up really good. We finished recordings of the album by another cover and that is Trial By Fire by band called Satan, which is still my favorite song from NWOBHM era. "Somewhere Far Beyond" was our first album with which we hit charts in almost all countries. For the first time we toured in Japan, where "Somewhere Far Beyond" peaked at #1 in charts. It was really great, because in city like Tokyo, we didn't expect to have such a support from people. I remember that we travelled there in summer and there was hot like in hell. We also didn't expect a lot of people to come at our concerts. In that time, also Rage toured Japan, so we partied a lot with them. In conclusion people were interested in us a lot. We were invited to lots of parties and we met lots of interesting people. I consider this period of my life as one of the best in my life. Again, we went on tour with Iced Earth we did a shorter tour; we didn't even visit all European countries. However we appeared at many summer festivals and for second time in the same year we toured in Japan, where we recorded our first official live album called "Tokyo Tales". Japanese people are great in technical stuff and they also care about quality, so that's why the whole record sounds so good. The title "Tokyo Tales" is inspired by live album called Tokyo Tapes by Scorpions, which was sort of "big name" in Japan for long period of time. After release of "Somewhere Far Beyond", we were nominated in Germany for Echo award in category: Most popular German band abroad. In comparison with previous record, we were in completely different situation. We were relaxed and full of energy. We didn't have big problems with creating new material. We had become priority for our label – Virgin Records and they were pushing and pressuring as much as possibly. We felt the time for change and for start working with people has come. Kalle Trapp was with us from our beginning, but we wanted to evolve as a band and also gain new experience. Of course, Kalle was very skilled and experienced producer and he knows a lot about music, but he was sort of limited in some way and in this phase, in which we get, he didn't have many things to offer us. We also changed location of the studio, for the first time we weren't recording in Germany but in Sweet Silence Studio in Copenhagen, Denmark. Originally, we were planning to stay here for 3 months but it ended up as 5 months. We had lots of good ideas; we were still remaking and improving something. We really tried to do our best. After release of "Imaginations From The Other Side" Thomas J. Miller had become our manager, who was before manager of Manowar. We had been friends for some time. Thanks to him, we had many concerts in USA or Spain, where we never played before. Spain showed up to be the very important country for us. We had a big attention from media all around the world. People from label wanted to make most of it, so they were pressuring us to record new album as fast as possible. Originally we wanted to put cover version of Mr. Sandman on Japanese version of "Imaginations From The Other Side", but they persuaded us to keep it for later. They were sure that this song would make superstars from us and that it will open the door for us everywhere. We shot a costy video for it and label put it forth everywhere they could. In 4 weeks we put together compilation called "The Forgotten Tales", on which Mr. Sandman appeared. Together with few other covers e.g. Surfin' USA, Barbara Ann/Long Tall Sally, which originally appeared on "Follow The Blind", appeared here. Whole album is a mix of older songs in acoustic or orchestral versions, new cover songs and cover songs that had appeared on our previous albums. Song Mr. Sandman wasn't that kind of success as it was expected by label. Also video didn't make hole into the Earth. We didn't really identify with this video clip. They wanted us to be dressed as women singing this song and as clowns. We agreed, but the result was that, that it burnt much money for nothing. Album "The Forgotten Tales" was selling good, but it wasn't a big sensation and it didn't gained as success as "Imaginations From The Other Side". We didn't tour to support this album, actually we concerted, but it was only continuation of "Imaginations From The Other Side Tour". In this time we parted our ways with our manager Thomas J. Miller, who had almost everything in control, starting with concerts ending with album sales. We lost a survey much money he's getting. This was an important moment for us, since which we are doing almost everything on our own. Nobody except us is interfering or influencing us, except people who we trust, e.g. the ones taking care of production or artists with whom we co-operate. We knew that it would be hard to come with album, which would be as good as "Imaginations From The Other Side" or even better. We also knew that it is the time for change in our discography, so because of this we had to do something special. Mostly André and me are writing new material. Many times, we discussed together options of our new musical way. We agreed that we would start working with orchestral music with Celtic influences. This is what we wanted to do, a combination of metal with classical folk music. I told him about my ideas for lyrics. He was blown out with my idea of doing a concept album based on famous Tolkien's book Silmarillion. I offered more options about the whole concept. One of them was inspired by Germanic myths. However, André liked the Silmarillion best. I knew that if I would start writing this that it would mean a lot of work for me. When you take Tolkien as an inspiration, you have to work on the whole story precisely. Everything has to carefully decided, when you want it to attract even people who are better "studied" at Tolkien. This was a very hard homework for me. We worked on songs in different way. Because usually André don't know the lyrics, but now it was different. In this case, André knew about what the lyrics are going to be and how the story behind them will continue. So according to this we wrote the music. The way in which we worked on "Nightfall In Middle-Earth" was new for us and it was the biggest difference between "Nightfall In Middle-Earth" and all our previous albums. It is unique how the music and lyrics go together and I think that "Nightfall In Middle-Earth" is the strongest album in our discography and our absolute top. We had many ideas and we were able to realize most of them. For the first time we were recording in our own studio called Twilight Hall Studios. We spent a lot of time working on this album and we put a lot of money into it. Final recording and mixing was done in again in Denmark and we worked again with Flemming Rasmussen. In that time we also met Charlie Bauerfeind, who had a big influence on drums and vocals on "Nightfall In Middle-Earth". We were amazed by his work that we decided that we want to work with him in the future. Fleming was of course good and he did a great job for us, but when considering classical and progressive elements in our music, Charlie was able to offer us more. We even started to have a clear vision about our next musical way and about the new album. We worked more than 8 months on "Nightfall In Middle-Earth" and on the last day of recording also mixing was finished. We worked intensively and without break. We also weren't partying, I don't mean it like that we hadn't have fun, of course we had, but we were more concentrated on music. We didn't have time for anything else. "Nightfall In Middle-Earth" had become our full-time job, and right after our return from Denmark the circus with propagation started. We didn't have any free day. We worked on promo until the start of the tour. When I found out, how hard the work on "Nightfall In Middle-Earth" was going to be; I decided not to play the bass. By chance, we met Oliver Holzwarth. He was the person who we really needed. Before he played in his own band, he was therefore skilled and I liked his way of working on music. His ideas and style of playing are also responsible for the fact that the album sounds different than the others. Material on "Nightfall In Middle-Earth" was so hard that we couldn't afford taking into band a musician with no skills. It was also big help for me, because of it; I was able to fully concentrate on writing lyrics, vocal melodies and singing. When we were on tour, for me it was strange just to stand on stage with microphone and not playing the bass. I had to deal with it. It was difficult, whole process of recording, promotion and tour. There was a big demand for us, so we had many concerts. We were all stressed and tired, but on the other hand, we gained a great success. On "Nightfall In Middle-Earth Tour", the number of fans became two times higher. We had an amazing production team. We played in almost all European countries, in some of them it was for the first time. I think it was the first time when we played here in Czech Republic, we played here at some festival, before we weren't able to get there, but at the time we played here, we were already very tired. After European tour, we had short break and then there was the most important show: as co-headliners at Wacken Open Air. Moreover, after that we went on South America tour. It was a mess, everything happened very fast. Because of stress and tiredness, I became ill on the tour, and we had to cancel the concert. It was impossible to do all this things and not to become sick. Whole "Nightfall In Middle-Earth Tour" was only about stress and work, that's we weren't able to enjoy it and have fun, even though it was successful. The other painful memory from those times is video-shoot for song Mirror Mirror. For this video, there was low amount of money available. And person, who didn't know what heavy metal is, did it. He tried to made documentary of us in style of Backstreet Boys, so that's why we always hated this music video. Another story begins, different than the other ones. As I said, after "Nightfall In Middle-Earth Tour", we were very tired. It was obvious that what we need is a long break. There was no chance that we would start working on new material right after that. Tour has ended in the end of year 1998 and we were expected to start working in the beginning of the 1999, which was absolutely unreal for us. We were in need of at least one year for gaining new energy and getting rid of the stress, which we were facing for quite a long period of time. The only thing what were able to do, was the cover for Ronnie James Dio tribute album called Don't Talk To Strangers, which the best one we ever did I think. Before returning to the writing process we agreed with André that it is necessary to do changes in instrumentation, arrangements... actually in almost everything, if we wanted the new songs to sound different than the older ones. It was unacceptable to do a similar album as "Nightfall In Middle-Earth" and to play the same music all the time. It took some time to find out what would best fit us. In the beginning some problems occured, because many things were new for us and almost everything sounded somehow different. We weren't following our usual rules. We have to work individually on each thing. From musical side, all songs on "A Night At The Opera" are different. When you consider songs Sadly Sings Destiny, Precious Jerusalem, Battlefield, And Then There Was Silence they all differ much from each other. Actually, whole record sounds different than everything we have done before. Now consider for example songs The Soulforged and The Maiden And The Minstrel Knight, I think they have nothing in common with The Bard's Song (In The Forest) , Hall Of The King or A Past and Future Secret. This record is different and interesting. We had so many ideas, so that it would be impossible to put all of them into one song. When we started working on pre-production, it was obvious that this album is going to be a big challenge for all of us. At the end of year 2000, I think in October or November, we were sure that new album will be finished in September 2001. After all, recording and mixing was finished in the end of year 2001. I would say that "A Night At The Opera" is very complex album with powerful songs and I think, And Then There Was Silence is the most powerful song ever done by us. Unfortunately for some fans was this record unacceptable. Eventhough we gained many new fans, because of it, we had lost many of our fans, who had been listening to our music since our beggining. I think that "A Night At The Opera" is the most controversial album in our discography. 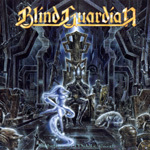 Many people were complaining about the title, because they found it unsuitable for Blind Guardian album. Though from our side it was only an attempt to capture the atmosphere of night at opera as Queen did on one of their album. We wanted their influence on us to be legible from this record and that's why we thought that this title would be suitable. Many people liked it, many people hated it. Everyone has its own opinion on it and there is nothing we can do about it. Personally I feel, that many people will appreciate this album after listening to our next two or three albums. We are still going further and further both as band and individual musicians and we want also our music to do so. We are on the best way to do next masterpiece as "Nightfall In Middle-Earth" is and, it will happen only because of the fact that we made an album like "A Night At The Opera", in which our next masterpiece will have an origin. Tour for "A Night At The Opera" was fantastic, we have had a huge promotion and positive reviews in media. We even had the time for rehearsing, which was inpracticable before "Nightfall In Middle-Earth Tour". Particularly European tour was successful. We tried to do our best during live presentation and we were unsparing in case of production. We took it very serious and we didn't want to go on tour with low-cost production. For the first time we used a stage with great acoustics, which was supposed to be a part of the live presentation of "A Night At The Opera". There is a artistical concept behind the album that we wanted to transfer on the stage including its special atmosphere. For the first time we were touring USA and Canada where we played about 25 concerts. We were quite successful there but, we weren't used to local climate and the lifestyle, so we became ill and we weren't able to give 100% performance in some concerts. The tor has ended at the end of year 2002 and by that time, we started to work on our first official DVD. We have had many good recordings from the tour, so we didn't have the problem with material, but we decided that the time for organising our own festival has come. Playing on different festivals was always interesting, but the show sometimes wasn't as good as we wanted, because of technical conditions. It was amazing to play for such a big audience as it was at Wacken Open Air, but we wanted something, where we would have everything in our hands. Festival turned out to be fantastic, it was a gathering of fans from whole world. I am also very satisfied with the DVD and the live album from it. Next problems we had to face were associated with our record company. Since 90's, big record companies were suffering from different financial crisis, which caused serious problems to almost all bands. From the biggest record companies only Warner, EMI and Universal survived. Unfortunately Virgin records, which was exellent record company for more than 10 years, came over the EMI. When EMI took complete control of Virgin, the ideology of label rapidly changed. For us, it became harder and harder to work with this label. When releasing our DVD "Imaginations Through The Looking Glass" many mistakes were done. We were unwilling to stay in this situation, because we have spent much time and money on everything, so we decided to end the contract with them. Then, we weren't looking for the huge label, logically it would make no sense for us, because only three of them were left and they had the same ideology. We were looking for well-known, but independent label. 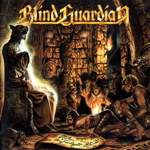 Fortunately we received an offer from Nuclear Blast, which was looking for a band like Blind Guardian. And after all, because many disagreements and various problems Thomen, our drummer, has decided to left the band. It happened sometime in the beginning of year 2005. We were left without drummer, when almost all songs for "A Twist In The Myth" were finished. We couldn't continue in production without drummer, and we also had signed to Nuclear Blast. A big dilemma appeared. We were in need of drummer, who would be able to accept the fact that we created our own style and trade mark, which was not accepted by old-school drummer like Thomen. It was obvious that new drummer wouldn't be of well-known name. We were looking for someone young and "fresh", who would be interested in doing new things. Suddenly, Frederik Ehmke appeared and he persuaded us with his video-record that he send to us. Three songs were on it, we didn't persuaded us only because of great energy with which he played, but he mostly persuaded us, because he was able to play both Thomen's old-school style and also more progressive style. It was just what we were looking for. Right after we've seen his video, it was obvious, that he would became the new drummer for Blind Guardian. Of course, before we made him a band member, we've had few rehearsals together, because we wanted to find out whether he fits into band not only as a musician, but also as a person. Fortunately, we found out that he is a great person, who brought into band a new positive spirit, which was the thing we needed that time. Tour with him was amazing for us. It was great that he had dealt with everything without any bigger problems. He is working hard, and he is becoming better and better. I am sure that people will be blown off, when they'll hear our new album and hear how good drummer Frederik is. He made a great job on "A Twist In The Myth", but you know, he came into band when already all material was written. And I am 100% sure that in next few years Frederik'll became one of the best drummers in metal scene. He already is a high-class, but I have great expectation in him, because in comparison with other band members, he is still very young. According to reviews "A Twist In The Myth" wasn't as good as "A Night At The Opera", eventhough the songs are more back-to-roots to older Blind Guardian album. Reviews weren't as good as I personally expected, but in case of fans record was accepted in quite a good way. So, I think that both us and Nuclear Blast should be happy. Same as on "A Night At The Opera", there are some new elements, which don't have to work for everyone, despite that I think that "A Twist In The Myth" is a good record. 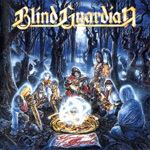 For me, listening to song Fly is an amazing experience, because I would have never thought that Blind Guardian would do song like that, but still it is a song by Blind Guardian. This is not only case of Blind Guardian, I like when someone, whose music I listen to surprises me with something new, eventhough it is not typical for one's discography. For surely I can say, that tour for "A Twist In The Myth" was the most successful in our career. And that's what brings us to the situation in which we are now. We still enjoy our work, writing new songs and playing concerts. Right now, we are working on pre-production of our new album. It is supposed to be released somewhere in year 2010, but definitely not before than September, probably later. Firstly, Charlie has to finish his work for RAGE, before he will start working on production for Blind Guardian. Production is planned for September 2009 and I believe that, everything will be finished in May 2010. Than, Nuclear Blast will decide, when the record will be released, because Blind Guardian belongs to Nuclear Blast's most important bands I think that they wouldn't keep that record unreleased for a long time. Maybe we should release it in July, however; July is not a good month for releasing new albums, so that's why maybe autumn 2010. In Germany a game called "Sacred II - The Fallen Angel" was released and we did a song on it called Sacred. I think that, because of this song, people now should know, what to expect from new album and how it will sound. I think, they'll be very surprised, when they'll hear what we changed and how big progress we made, not only because of Frederik, but also because of other band members. We already have 2 or 3 songs which are same good or even better than Sacred. When comparing those songs to songs from "A Night At The Opera" and "A Twist In The Myth", I think that they are more open in some way. We are still working on the "Orchestral Project", on which we are slowly working since Nightfall-times. It will map Blind Guardian's history in some way. It will be a classical album with new songs written for orchestra and vocals. By the time, we have already 11 songs written, and possibly orchestral project will be finished at same time as new album will be. The question "When I will be able to record vocals for it?" remains. According to our plans it is supposed to be released at the end of year 2011 or beginning of 2012. Or maybe we will release it, by the time when Blind Guardian will celebrate 25 years of existence. Maybe another Blind Guardian Open Air will be held because of it. Who knows? If everything will go in good way, "Orchestral Project" will be released in same time as festival will be held, but we have to find a good place for it. If it all will be done according our plans, I am sure that it will be a blast for both us and our fans.